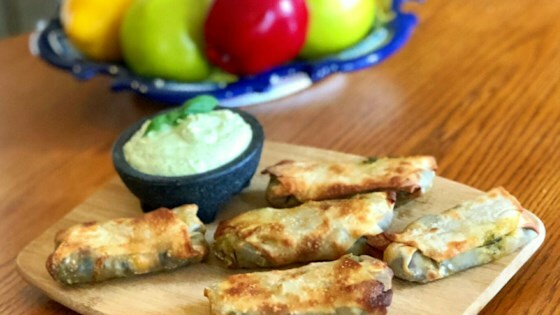 "Avoid frying by cooking these Southwestern egg rolls in an air fryer and achieving the same crispiness!" Mix corn, beans, spinach, jalapeno Jack cheese, Cheddar cheese, green chiles, green onions, salt, cumin, and chili powder together in a large bowl for the filling. Lay an egg roll wrapper at an angle. Use your finger to lightly moisten all 4 edges with water. Place about 1/4 cup of the filling in the center of the wrapper. Fold 1 corner over filling and tuck in the sides to form a roll. Repeat with remaining wrappers and mist each egg roll with cooking spray. Preheat an air fryer to 390 degrees F (199 degrees C). Place egg rolls in the basket, making sure they are not touching; cook in batches if necessary. Fry for 8 minutes; flip and cook until skins are crispy, about 4 minutes more. Very good. I used frozen spinach that I thawed out. That was the only change I made.